Abstract: Originally geared towards execs on the go, the Compaq iPAQ 3650 Pocket PC works just as well in the hands of the business user. Microsoft's answer to Palm Inc.'s "Palm" based PDA's, their "Pocket PC" brand is steadily gaining popularity, easing Palm's stranglehold on the hand held market and cutting into their market share. Originally geared towards execs on the go, the Compaq iPAQ 3650 Pocket PC works just as well in the hands of the business user who really only needs an up to date electronic address book. As the "Pocket PC" moniker implies, this little hand held wonder is able to perform many of the tasks a desktop PC is able to do, but is still small enough to stow away in your pocket. The iPaq 3650 sports a 206 MHz Intel StrongARM Processor, 32 MB of RAM, 16 MB of ROM, and a 12-bit (4096 colour) Thin-Film Transistor (TFT) Display. The iPAQ's hardware enables speedy access to all your appointments, contact info and notes; not to mention more advanced multimedia capabilities in the form of MP3/WMA playback, voice recording and offline web browsing/email. Also found on the iPAQ is a stereo audio output jack for ear buds, an infrared port for transferring files between iPAQ users, and an expansion bay which accommodates Compact Flash for further storage. In addition to what's found on the iPAQ, the little silver hand held comes bundled with a USB 1.1 compliant docking cradle (enabling you to synchronize all your files, contacts, etc. with your PC), two styluses, an AC/DC adapter for recharging, a few protective covers, and MS ActiveSync 3.1 software. 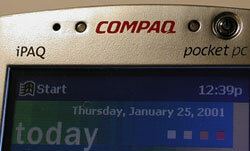 The Compaq Pocket PC (or should that now be HP-Compaq Pocket PC?) comes preloaded with Windows CE 3.0 Operating System and a whole assortment of productivity software. For instance, the iPAQ also comes with Pocket variations of MS Word, Excel, Media Player, Money, Picture Viewer and Internet Explorer. As you can imagine, the iPAQ 3650 is bursting at the seams in terms of features, common software applications and the like. With careful examination of the iPAQ 3650, we're able to discover that it is very solidly constructed and that Compaq has paid attention to details. Compaq has designed the iPAQ with ergonomics in mind. The unit fits in the comfortably, and in such a way that it is less likely to get dropped. Unlike most Palm hand helds, or in some cases Pocket PC's, the iPAQ 3650 is not constructed from a flimsy feeling plastic. Taking a cue from today's notebooks, the casing is magnesium alloy - meaning it will resist the trials of life in a pocket with much more grace and durability than otherwise possible with plastics. 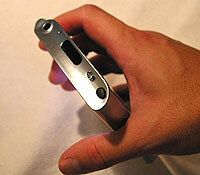 At the same time, the iPAQ remains light weight and imminently portable. Turning on the iPAQ 3650 brings to life a gorgeous colour LCD display that breaks the trend from standard high-contrast greyscale LCD's found on the majority of today's PDA's. Moreover, the screen is illuminated through small lights on the edge of each side of the screen, allowing you to see the screen clearly on a bright sunny day or in a dimly lit movie theatre regardless. There are a total of six pre-programmed buttons (for notes, calendar, contacts etc.) and a 5-way directional button on the face of the unit. Navigating through the Pocket PC OS, or various programs is pretty standard, and depending on which function you want launch, the short-cut keys will get you to the most common applications quickly. Cleverly hidden within the 5-way directional button is the speaker. Although sound quality is not all that good, it gets the job done. Upon further examination, we find that there's a carefully hidden microphone (right next to the "C" in the Compaq logo) giving you the ability to record audio notes digitally in the event you get a brilliant idea while taking a walk in the park. Finally, on top right corner of the iPAQ, there is a built-in stylus holder, with a snappy eject button. With a little push, the stylus pops up in a very cool eye-catching "Matrix" fashion.